Sintering is a manufacturing process in which metal alloys in powdered form are molded into unique and complex shapes by subjecting them to high temperatures just below the melting points of the metal alloys being used in the process. The process of sintering is being preferred over the traditional methods of manufacturing components, since sintered parts have superior qualities such as corrosion and abrasion resistance, light weight, etc. Sintering is an important stage in powder metallurgy and is followed by various stages in order to obtain an end product. The raw materials usually used for the process of sintering are metal powders of low grade alloy steels such as pure iron, Fe – Ni alloys, Fe – Si alloys, Fe – Co Alloys, 42CrMo4 steel, and 100Cr6 steel. Sintering is used on a large scale to manufacture complex components to be used in end use industries such as automotive, defense, and aerospace. Among the above stated low grade alloy steels, pure iron was used widely in sintering process in Europe in 2015 and is expected to be utilized at the same rate in the years to come. The Europe sintering market is projected to reach US$11.09 bn by the end of 2024, from its valuation of US$8.35 bn in 2015. Considering this, the sintering market in Europe will exhibit a CAGR of 3.2% between 2016 and 2024. By material, pure iron, Fe – Ni alloys, Fe – Si alloys, Fe – Co Alloys, 42CrMo4 steel, and 100Cr6 steel are the key market segments. Of these, pure iron material constituted the leading market share of 35.7% in 2015. The segment is expected to remain dominant through the course of the forecast period. Pure iron boasts wide industrial applications, especially with various materials to form base of alloy mixtures. Pure iron offers superior properties such as high corrosion resistance. It is therefore increasingly used across industries as a material for sintering. Besides this, the demand for Fe—Ni alloys and Fe—Si alloys is forecast to increase during the forecast period. Their demand will spur on account of their superior characteristics such as higher permeability and high electric resistivity. Among the alloy steel considered low grade, the market for 100Cr6 steel may witness steep decline in its market share due to less application in industries. In Europe, the U.K., Germany, Italy, France, and Spain have emerged as the most lucrative sintering markets. These nations, coupled with Rest of Europe, constitute the key segments in the Europe sintering market based on country. Of these, Germany held clear dominance in 2015 with a share of 24.4% in the Europe market. The presence of a large number of manufacturing units of automotive spare parts has fuelled the demand for sintering components in the nation. The market has also witnessed remarkable growth in the U.K., in the last few years. The country boasts a sophisticated aerospace and automotive infrastructure, which has catapulted it as an attractive market for sintering in Europe. Besides these, the market players are expected to witness robust opportunities in various European nations through the course of the forecast period. Rest of Europe also held considerable share in the market in 2015 due to presence of major countries such as Sweden where there are various automotive industries situated. 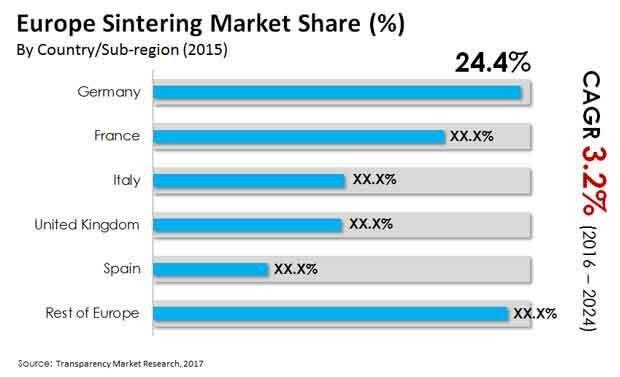 The sintering market in Europe is expected to grow at a moderate rate during the forecast period. Some of the leading companies operating in the Europe sintering market are GKN plc, H.C.Starck GmbH, AMES, ASCO Sintering Co., Metaldyne Performance Group, LLC, Hitachi Ltd., etc.